Ear, Epithelium - Hyperplasia in a male Fischer 344/N rat from a chronic study. 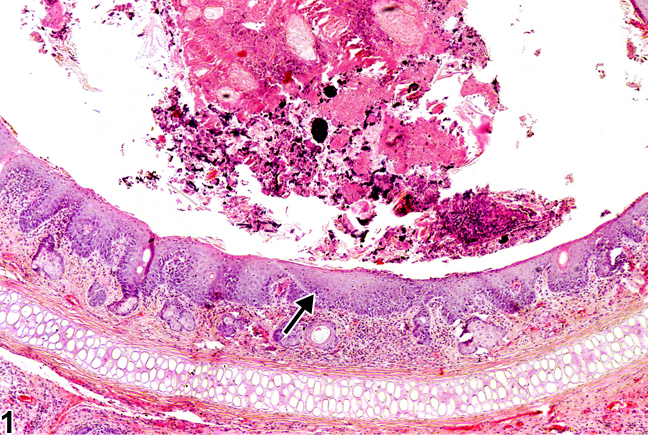 There are increased layers of squamous epithelial cells with some rete peg formation is present; a large aggregate (asterisk) of cerumen and necrotic cell debris is also present. Ear, Epithelium - Hyperplasia in a male Fischer 344/N rat from a chronic study. 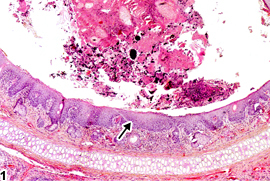 The exophytic, papillary projections of squamous epithelium in the external ear canal (arrow) represent focal hyperplasia. Ear, Epithelium - Hyperplasia in a male Fischer 344/N rat from a chronic study. There is a complex papillary pattern of squamous epithelial hyperplasia in the external ear canal. 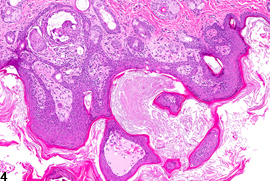 Ear, Epithelium - Hyperplasia in a male Fischer 344/N rat from a chronic study (higher magnification of Figure 3). 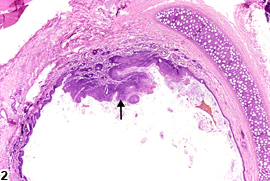 Hyperkeratosis and chronic-active inflammation accompany the squamous epithelial hyperplasia. 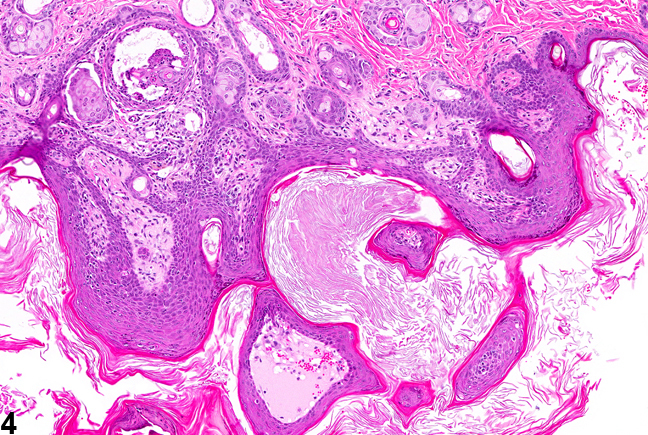 Hyperplasia of the lining epithelium of various ear regions is usually due to topically applied irritants or secondary to concurrent inflammation. Morphologically, the lesions vary from diffuse thickening of the external ear canal squamous epithelium due to increased cell layers with some rete peg formation ( Figure 1 ) to focal but more pronounced epithelial hyperplasia with exophytic papillary formation ( Figure 2 , Figure 3 , and Figure 4 ). 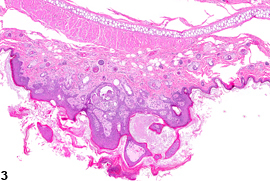 There may also be prominent secondary hyperkeratosis of the squamous epithelium, characterized by thick layers of keratin lamellae sloughing into the canal lumen ( Figure 3 and Figure 4 ). When occurring as a primary, treatment-related effect, epithelial hyperplasia of the ear should be diagnosed and graded. An appropriate site modifier (external ear canal, etc.) and type modifier (squamous, etc.) should be included in the diagnosis. Squamous hyperplasia secondary to concurrent inflammation should not be diagnosed separately unless warranted by severity, though it should be described in the pathology narrative. 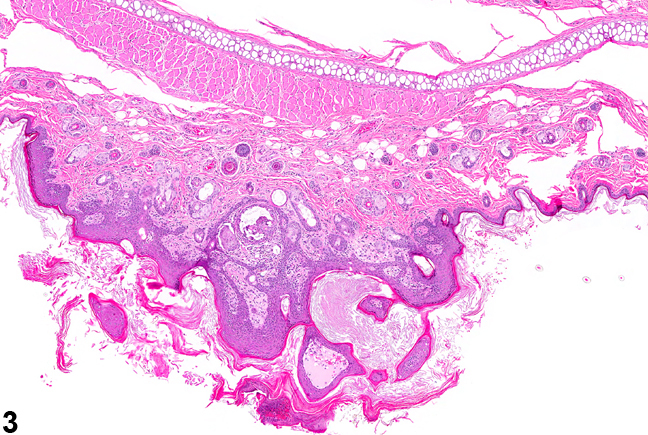 Hyperkeratosis is almost always secondary to concurrent squamous epithelial hyperplasia, and thus should not be diagnosed separately (unless warranted by severity), though it should be described as a feature of the hyperplasia in the pathology narrative. Maeda K, Hirano T, Ichimiya I, Kurono Y, Suzuki M, Mogi G. 2004. Cytokine expression in experimental chronic otitis media with effusion in mice. Laryngoscope 114:1967-1972. National Toxicology Program. 1985. NTP TR-295. Toxicology and Carcinogenesis Studies of Chrysotile Asbestos (CAS No. 12001-29-5) in F344/N Rats (Feed Studies). NTP, Research Triangle Park, NC. National Toxicology Program. 1986. NTP TR-289. Toxicology and Carcinogenesis Studies of Benzene (CAS No. 71-43-2) in F344/N Rats and B6C3F1 Mice (Gavage Studies). NTP, Research Triangle Park, NC. National Toxicology Program. 2012. NTP TR-580. Draft Report. Toxicology and Carcinogenesis Studies of β-Picoline (CAS NO. 108-99-6) in F344/N Rats and B6C3F1/N Mice (Drinking Water Studies). NTP, Research Triangle Park, NC. Wright CG, Pawlowski KS, Roland PS, Meyerhoff WL. 2000. An animal model for external ear canal inflammation. Laryngoscope 110:1112-1118. Yoshitomi K, Brown. 1990. HR. Ear and pinna. In: Pathology of the Fischer Rat: Reference and Atlas (Boorman GA, Eustis SL, Elwell MR, Montgomery CA, MacKenzie WF, eds). Academic Press, San Diego, CA, 227-238.